Configure this sectional sofa in a way that perfectly fits your home. Loveseat and sofa sections give you the freedom to seat as many people as you need, while chaise components offer the ideal spot to kick your feet up and unwind. Hundreds of leather and fabric options and numerous configurations allows you to completely customize the look of your living room. The Nash Contemporary Sectional with Right Arm Chaise and Solid Walnut Legs by American Leather at AHFA in the area. Product availability may vary. Contact us for the most current availability on this product. NSH-SCH-RA Right Arm Chaise 1 65" 34" 31"
NSH-SO3-LA Left Arm Sofa Section 1 94" 38" 31"
Create a space full of unique details with this contemporary sofa collection. The track arms of each piece take on an angular look different from anything you've seen before. 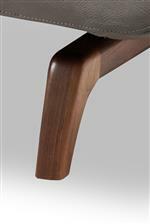 Solid walnut legs have a curved shape that contrasts the clean lines of the collection's design. 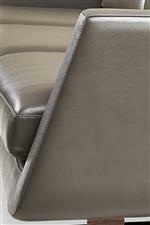 Durable foam cushions offer plenty of support and ensure that you'll be sitting comfortably. Quality construction and modern design will make the Nash collection a focal point for your home. The Nash collection is a great option if you are looking for Contemporary furniture in the area. Browse other items in the Nash collection from AHFA in the area.